The device is designed for automatic removal of lungs from eviscerated chicken carcasses in the weight range from 0.8kg to 2.5kg. The device should be placed as the penultimate one (before the automatic inside and outside washer) in the evisceration line. The device is manufactured with shackle pitch of either 6 inch or 8 inch. Main shaft, with cam drum made of plastic. Upper and lower support plates are mounted in the upper and lower part of the drum, respectively. Vertical guide sets are mounted between the upper and lower plate. Each guide set consists of 2 sliding rods and one slider. The movement of sliders is controlled by a ø50 plastic wheel mounted in the back part of the slider. The wheel is guided along the track of the cam drum. In the front part of the slider, a vacuum suction system is mounted with a built-in vacuum lock. The vacuum distributor is mounted at the bottom of the lower plate. Negative pressure is applied to the distributor through two Ø75 hoses ended with a 110 mm ball valve mounted on the side frame. The position of carcasses is fixed by the guiding rail and foot guide mounted in the lower part of the main shaft. The guiding rails are mounted to the guide to make sure that negative pressure is applied when chickens enter the device for processing. Drive to the rotating parts of the device is transmitted from the overhead chain conveyor by means of a drive wheel mounted underneath the upper transverse beam. Carcasses enter the device with their backs towards the inside of the device. The guiding rail, mounted to the lower guide, moves chicken legs towards the vacuum lock, and then the vacuum sliding device is shifted downwards along with the sliding block, which activates the vacuum system. It means that if there are no chickens inside the hoop, negative pressure is not applied. 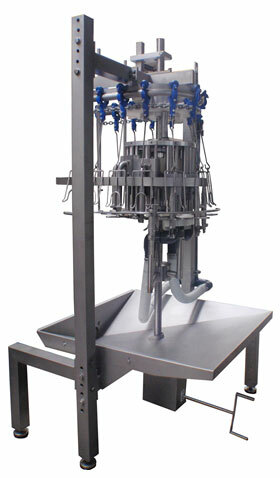 The sliding block introduces vacuum hose into the carcass. The vacuum system ensures that the vacuum device is not activated until the end of the suction hose is inside the carcass. Lungs are sucked out of the chicken and sent to the collecting tank through the vacuum system.